Commissioned in December 2001, the Huangshi Chinese Garden was officially opened on 14 November 2007 with ten delegates from Nelson’s sister city , Huangshi, in the Hubei Province of China, in attendance. The Chinese garden symbolises Nelson’s sister city relationship with Huangshi. The site selected within Queens Gardens is well suited, with several trees of Chinese origin providing a shaded, quiet space. The large 120 year old camphor laurel tree on the opposite side of Queens Gardens’ pond, coincidentally, is native to Hubei Province where it is the state tree. It is used as a street and civic tree in Huangshi. The Garden features a walled, intimate space with windows in the wall filled with latticework patterns of camellias, peonies and butterflies. The walls are plastered, whitewashed and capped with traditional clay tiles brought in from China. Water in a Chinese garden represents the ongoing fluidity of life, it should ‘flow freely as though it has no end’ and the garden pond in the Huangshi Garden flows from a waterfall into the pond around a concealed bend and out into the Queens Garden Pond. The focal point of the garden is its pavilion, or ‘xie,’ with a distinctive, upturned tiled roof. Weathered limestone rocks from Tarakohe in Golden Bay were used—the limestone closely resembles that found in traditional Chinese gardens. The roof of the xie was created with genuine Chinese roofing tiles direct from Hubei Province. All of the garden details have been approved by sister city Huangshi. The total cost of the garden, spread out over five years, has been $645,000, of which the Council contributed $540,000. The remainder of the funding came from a variety of organisations, including the Huangshi Municipal People’s Government, the Canterbury Community Trust, the Chinese Poll Tax Heritage Trust, the New Zealand Community Trust, and by the fundraising efforts of the Nelson branch of the New Zealand China Friendship Society (NZCFS), who first proposed the idea of the Chinese garden to Council. Other significant contributors include the Lion Foundation, Scottwood Group, the City of Nelson Civic Trust, and Pub Charity. Chinese gardens have three purposes: as function, as art and as an ideal. A garden ‘as function’ is intended to be the setting for a good life; an extension of the house and home, it is a place for recreation, vegetables and fruit, water, and domestic animals. The garden ‘as art’ is intended to feature water flowing freely, walls that define and create spaces, winding walkways and footpaths that zigzag, plants abounding, and windows to give glimpses and entice people to look inside. Plants used throughout the garden include pine, bamboo, plum, and orchid. The garden features flowers signifying the female presence, including peony for wealth and lotus for purity. The garden ‘as an ideal’ signifies a theme and a literary expression of poetry and art. The garden serves as a place for literati, scholars, and royalty. Two stunning Fu Dog statues grace either side of the entrance to the Chinese Gardens, thanks to Nancy Macy, a regular visitor to Nelson over the past 17 years. 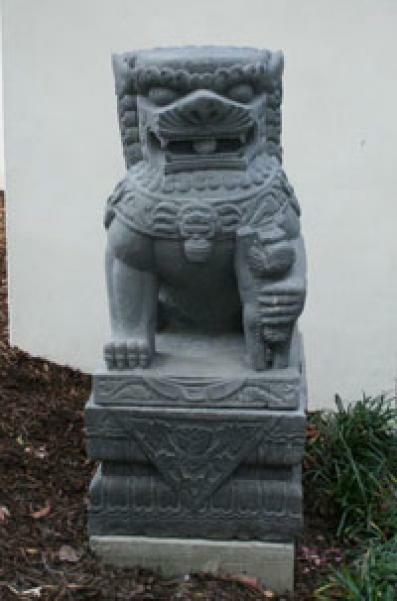 She donated the statues, carved from stone by Chinese carvers, to be placed in the entrance to the Gardens. Fu Dogs are the ancient sacred dogs of Asia that guard Buddhist temples. They are commonly placed at business institutions, temple gates, home entrances, tombs, or in front of government buildings to scare off evil spirits. They have the appearance of a lion, a sacred animal in Buddhism, who is the proud master of all cats. Fu Dogs can be traced back as early as the Han Dynasty, first appearing in Chinese art in approximately 208 BC. The pair guarding the Chinese Gardens is a traditional male/female pair, with the male playing with a ball that symbolises the Earth and the female holds a cub and protects those who dwell inside. Huangshi Chinese Garden is situated in Queens Garden; the walled and roofed entrance is located off Tasman Street. It is open daily from 7am to 8pm. NOTE: This story is an edited version of the information on the Nelson City Council website, 2009, compiled by Jungle Payne. Want to find out more about the Huangshi Chinese Garden ? View Further Sources here.